The Guitar Rig 3 XE software and the Session I/O interface. Guitar Rig Session is a brand new addition to Native Instruments´ product range - it´s a three-pronged recording solution that comes at a competitive price. The package comprises amp/effects modelling software, an audio interface and a DAW. The modelling software goes by the name of Guitar Rig 3 XE. It features five tube amp models, 12 cabinet types and 21 stomp boxes/effects units. All of these elements can be mixed and matched in a virtual rack, and 150 preset tones come included. Other features include dual ‘tape-decks´, metronome, tuner and a Live view. Audio interfacing is handled by the Session I/O, a USB 2.0 device that contains a pair of instrument preamps and is capable of 24-bit/192kHz operation. A mic input and a headphone output are also onboard. Finally we turn to the supplied DAW - Cubase 4 LE. This can handle 64 tracks and is based on the full version of Cubase 4. As further bonus, NI is also throwing in a copy of Kore Player (though it should be noted that this can be downloaded for free anyway) and the Pop Drums acoustic drum library (this retails for $79/€69). With these tools, you´ll be able to start building backing tracks right from the off. Although Guitar Rig Session doesn´t contain any new technology, its blend of features could make it a winner. Guitarists who want to get all the tools they need to start recording in one hit should definitely take a look. Slated to ship in June 2008, Guitar Rig Session will cost $249/€229/£200. 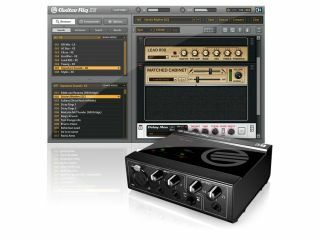 If you don´t need the audio interface or the copy of Cubase, you´ll also have the option of buying Guitar Rig 3 XE on its own for $119/€99/£80.